Privacy is a big deal. More than a big deal, the concept of privacy is a cultural phenomenon in the United States. Apple’s battle with the FBI in the early part of 2016 launched the privacy discussion into the national spotlight like never before. What became clear is that, for most of us, our phones are our life and we don’t want anyone sneaking into our digital lives. But the concept of privacy extends beyond who’s allowed to hack into our phones. We like our personal space, we don’t want to be crowded out in bed and we don’t want to be brushed up on at the dinner table. When it comes to work, we don’t want nosy coworkers peeking over our cubicle wall with inquisitive and annoying stares as we are trying and close a sale. Where did our obsession with privacy come from? That’s a question that has many implications, not the least of which includes understanding why and how privacy effects the way we work. First, the Definition: What is Privacy? To get a solid definition of what privacy is, or at least what it means, we turned to a 2013 article from The Atlantic. Reporter Jathan Sadowski interviewed Georgetown University law professor Julie E. Cohen who had written a soon-to-be-published article about privacy for the Harvard Law Review. That’s an interesting definition when taken in the context of the workplace. Our jobs are, in a way, part of our self-development. We put up privacy screens and other panel extenders because we want space to be ourselves and do our thing. Security expert Daniel Solove provided the next step in the privacy argument when he published a LinkedIn piece in 2014 titled, “10 Reasons Why Privacy Matters.” In his list, Solove noted that privacy helps maintain appropriate social boundaries. It’s an interesting point, especially as it pertains to the workplace. You don’t always get a place to retreat in your office, but having a private cubicle with sound-deadening panel extenders gives you a sense of ease and solitude, a sense that you aren’t under the constant gaze of your co-workers or bosses. This anonymity is crucial to performance, as employees who feel like they’re constantly being watched are more likely to make mistakes and avoid creativity. They play by the rules and avoid standing out. As we just mentioned, providing individuals (employees included) their own space – even if their privacy is extended by 12 inches – can lead to a healthier, more creative state of mind. In a 2014 article from The New York Times, reporter Kate Murphy talked about privacy’s role in workplace creativity. She went on to say that psychological literature likens privacy to sleep; we need moments of not being watched just like we need moments of slumber. 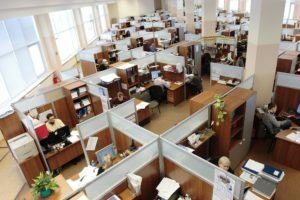 In business terms, adding privacy to an office’s cubicle systems equates to a massive logistical headache. Desks have to be broken down, computers have to be removed, network cables have to be rerouted and employees are displaced. Our panel extenders skip all the hassle and can be installed in a matter of hours. We can even do installations while employees are working. Contact us and we’ll be happy to talk to you about solutions for your workplace.